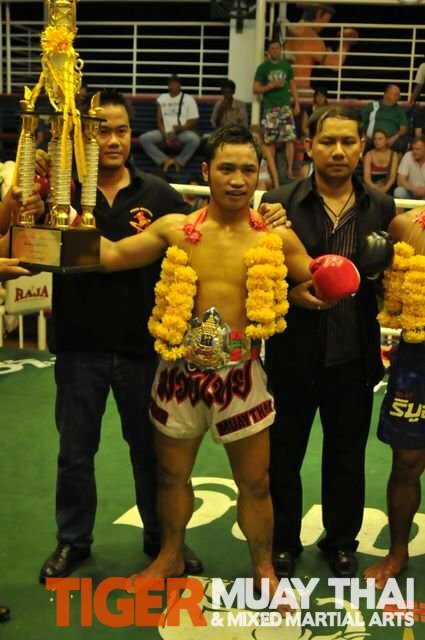 Tiger Muay Thai and MMA training camp, Phuket, Thailand instructor / fighter Ritt scored 3 straight KO’s to win an 8-man-fight-tournament at Bangla Thai Boxing Stadium on May 18, 2010. Ritt started out with two straight first round KO’s within the first 1:30 of each round and had plenty of strength and endurance entering the third and last championship fight. Ritt needed only 15 seconds to dispatch his opponent with his famous left hook body shot to the liver tht dropped his opponent for 3 straight 1st round KO’s to win the tournament championship, trophy, and title belt.